So Brandon Finnegan walks a guy with 13 walks this year, then gives up a single to Markakis. Not the best start to the sixth for KC. Markakis singles. Runners on 1st and 2nd, no outs. Kelvin Herrera is up in the Royals bullpen. Common sense would suggest he'd face the RHH trio of Jones, Cruz and Pearce. Schoop caught between 2nd and 3rd, but throw to 3B hits off top of Schoop's helmet. Runners to 2nd and 3rd. Schoop, on the throw down to second, breaks for third and the ball hits him. He gets in there, however. Looks like throw went off Schoop's back. It's starting to rain at Camden Yards. 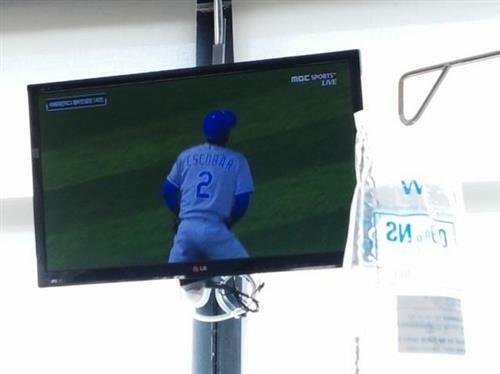 The Royals defense has betrayed them here in the sixth. Escobar plunked Schoop with a throw, then he can't get under a bloop by De Aza. 5-5. De Aza pop up drops in the Royals infield. Schoop scores. 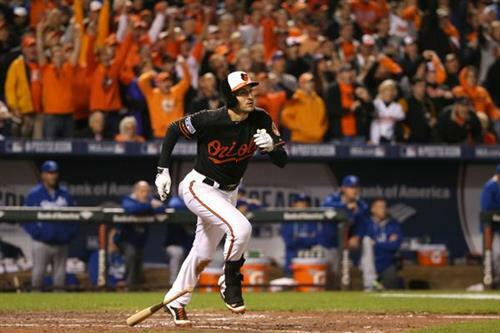 Orioles tearing up the bases, just like you expected. De Aza with a bloop that drops just past mound of IF single. 5-5 game. Where was Infante on that? Brandon Finnegan jogs off without a single out and with the Royals' lead gone. Game tied at 5 and Orioles on at corners with no outs. Kelvin Herrera is here, along with a light rain. Herrera is coming in to face the heart of Baltimore's order. The go-ahead run stands on third base. There are no outs. Who knows... Just for another big stage for comeback victory!! Tied game.. Not done yet!! "@devil_fingers : The Royals are getting Royaled." And the rain has arrived. Forgive me. Markakis is at second base. He is currently standing at third. But we are not in regulation. Thank you all for your help. Infield pop-up by De Aza finds the grass, and we're tied. O's have runners on 1st and second, no outs. This game confirming my suspicion that this is going to be one wild ALCS. Raining harder as Jones steps up. Adam Jones knows the proper way to wear his socks. Kelvin Herrera points skyward. He gets Cruz to hit into a double play to end the sixth. We are tied at 5. Kelvin Herrera is a magician. Just made the Orioles' rally disappear. Tied at 5 going into the seventh of Game 1 of the ALCS. As my seat mate @IanMBrowne already said, this is going to be one heck of a series. Royals escape with double play. 5-5 headed into the 7th. The @Royals have the home run. The @Orioles are super aggressive on the basepaths. What if... Esky didn't dive for a ball, let it bound & throw home.. Was it safe? ?